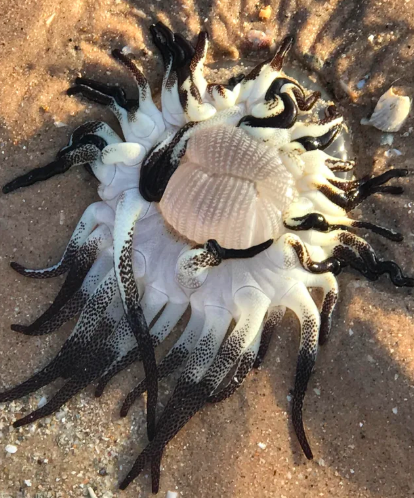 A weird alien-like creature washed up on the Australian shore and people have been speculating about what it could be. Considering more than 80 per cent of the world’s oceans are unexplored, there’s bound to be a whole range of weird and wonderful creatures out there which humans have never laid eyes on. But since we fear the unknown, any of those creatures which unexpectedly make their way to the surface are almost instantly presumed to be visitors from another planet. While that theory usually isn’t true, this particular being certainly didn’t look like it belonged on earth. The strange sea creature washed up on a beach in Broome, on the northern coast of Western Australia. A picture of the tentacled being was shared on a Reddit community titled ‘what is this thing’, after the user’s mother and girlfriend discovered it on the beach. A few of those responding were just as confused as the person who shared the picture, with one writing ‘What the heck?’, and another simply advising ‘put it back’. 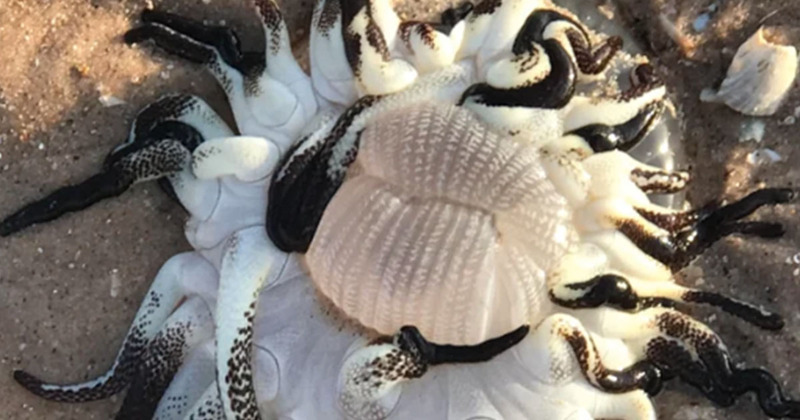 After some speculation, commenters began to agree that the animal in the photo looked like an armed anemone, a sea creature which can be found in the tropical waters off the coast of Western Australia. They can grow up to 50cm and are usually more colourful than the one in the photo, but Reddit users suggested the creature may have been bleached by the sun. One person had suggested the mysterious animal was some sort of jellyfish, but changed their minds once they read alternative theories, realising the creature was too ‘thicc and juicy’ to be a jellyfish. Probably a description we could have lived without, but oh well. It’s an upside down jellyfish of some description – we get them in Devon, UK a lot but different species/colouration. edit – I stand corrected, it’s more likely an anemone, them there arm thingies are too thicc and juicy to belong to a jelly [sic]. I agree, it’s a species of anemone its mouth is protruding, that’s usually what you see after they eat something or are royally pissed off. If you look closely you can see it’s foot is submerged in the sand. They can get to be some very funny shapes when they get shipped or in this case beached. Worked with coral and marine fish for 15+ years. Well, there’s that mystery solved!